Based on one the biggest joint anime and video games projects of recent years, Full Metal Alchemist (FMA) is set to take Britain by storm when the Playstation 2 game is released in March and when the DVDs follow in May. 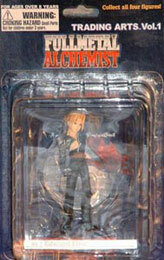 With the huge potential that FMA has, it is only fitting that the figures rock! 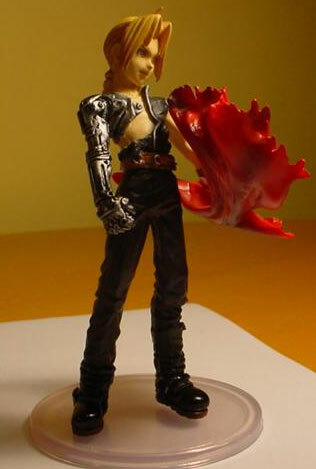 First up is main character Edward Elric who stands 11cm (4.4") tall (with base) and is very well detailed and colourful. 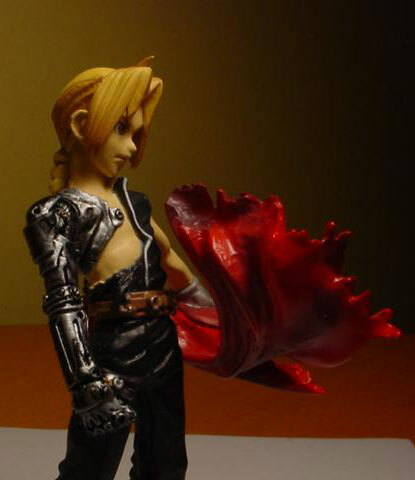 It is a great pose for the character as well, with Edward whipping off his jacket to unveil his mighty metal arm, preparing himself for the fight. The detail on the jacket and metal arm is exceptional for a figure of this price as the jacket is captured in a mid-air windsweep and the metal arm does look properly cybernetic. The facial features are also of high quality, in fact there is very little to criticise about this figure and is great for anime fans whether you are into FMA or not. The only quibble I have with this figure is that the base is clear and I would have found a black base more suitable personally. 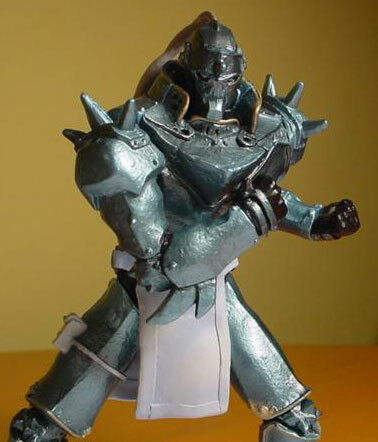 Secondly we have the mighty robot Alphonse in a pose that definitely says you would not want to mess with him. Perfectly representing the character, this figure stands at 12cm/4.8" (approx) tall. 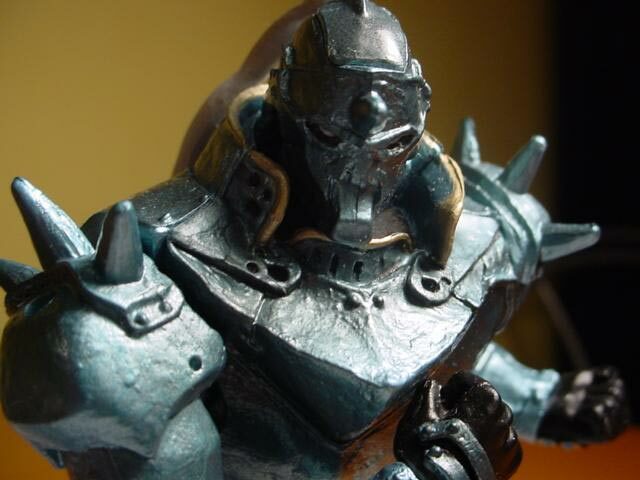 Alphonse has an excellent metallic blue finish that really will make him stand out on your shelf and the insignia on his left shoulder is a nice touch. No base is included with this figure, but this does not matter as it is pretty weighty and completely stable. I will warn you to keep this one away from the kiddies though as the plastic quiff on Alphonse's helmet could snap off quite easily. That is a minor quibble though as this figure really does do FMA justice and not many figures costing £7.95 are this good. Buy it if you like your robot anime, DEFINITELY buy it if you are a FMA fan! So overall two great examples of a fantastic figure range that makes me look forward to the UK release of FMA even more!